Born just two minutes before her twin sister, Bianca often assumes the role of the “big sister,” and loves to take charge. Her sense of responsibility and quick-wittedness make Bianca mature for her young age. After working closely with a female director on a recent project, Bianca has found her calling, and one day dreams of being behind the camera, as a director herself. The younger of the twins, Chiara, is much more of a jokester and a free-spirit. She loves to channel her innate creativity into fashion and styling outfits for her and her sister. Hailing from Santa Monica, Calif., twins Bianca and Chiara D’Ambrosio broke into show business at 2-and-half-years-old, and haven’t looked back since. Since beginning their acting career as the on-screen daughter to Michelle Stafford and Joshua Morrow on the long running CBS daytime drama series, “The Young and the Restless”, Bianca and Chiara have aquired an impressive resumé of credits—making guest appearances on shows such as “The Closer” (TNT), “Parks and Recreation” (NBC), “Close to Home” (CBS), “See Dad Run” (Nick at Night), “Jeselnik Offensive” (Comedy Central), and “Legit” (FX), among others. Keeping busy, Bianca and Chiara also appeared on the NBC pilot entitled “Guys With Kids”, starring opposite Sara Rue and Jamie-Lynn Sigler, and have shot numerous commercials and ads for companies such as Subaru, Toms Shoes, and Glittertainment. In late 2012, inspired by their own bullying experiences, the twins released their debut single, “Let Your Light Shine” which quickly became an anthem for anti-bullying efforts worldwide. The accompanying music video — which co-starred a few of their celebrity friends — went viral and generated nearly 1.5 million views in 72 hours. The music video was an Official Selection at top film festivals worldwide garnering “Best Music Video” honors from several juries. Young Hollywood rallied around the pint-sized pair by posting pics of themselves wearing the twins’ “Let Your Light Shine” t-shirts, including: Kristin Cavalleri and Aly & AJ, among others. Bianca and Chiara’s efforts were recognized at the prestigious 2013 Gracie Awards in NYC where they became the youngest recipients to be honored in the history of the Awards. As a follow-up to the wildly successful release of the “Let Your Light Shine” single, Bianca & Chiara D’Ambrosio will release their self-title debut EP on September 23rd on Blue Eyed Club Records. 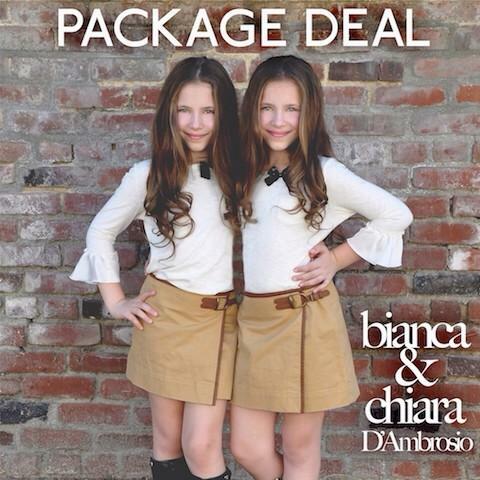 Produced by Andrew Lane, the EP features a track-list that showcases the twins’ vocal talents, including the first single, “Package Deal” that will drop on September 16th and avail via iTunes, Amazon and other digital music distributors. « Vanessa Hudgens Grabs Coffee For Two — See The Pics!